Tarps Plus Blog: To Enjoy The Sun Get A Mesh Tarp! Many of us are not aware what a wonderful level of perfect shade a mesh tarp can make. A mesh tarp comes in 3 different colors and the tiny openings throughout the tarp let in just the right amount of shade. Many like to use the mesh tarp for enclosing patios and as canopy tarps. Mesh tarps make excellent fence tarps as well, making your area private but still without the dramatic effect of blocking out the views 100%. Many people like to use the mesh tarps to separate areas within their property such as the play area from the animal area in the far back. This way if you have a backyard party or celebration you can keep your guest from having to see the chaos going on in the horse den. Mesh Tarps are truly a great type of tarp and it definitely has many ways it can be used. Between the 3 different colors that Tarps Plus carries there is 3 differences in the different colors. 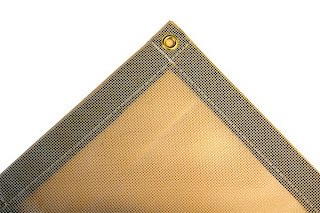 The Tan colored Mesh Tarp is a lighter duty mesh tarp with less braiding within the tarp, the Black Mesh tarp is a step up from the tan mesh tarp, it is a bit thicker material but for super heavy duty the green comes with a second layer of black mesh mixed in the tarp making it ultra thick and long lasting. Mesh Tarps are truly a Go tarp and one of the many favorites. Today www.Tarpsplus.com is having discounts on all the tarps available on the web site, check them out now just click here and start saving!. I had never really thought about using the mesh tarp to separate my areas but this is a great idea! Looking forward to receiving my order of 4 mesh tarps. Just purchased 2 mesh tarps I am very excited to put them to use. These are all great ideas, I love the patio enclosement idea, surely will try!